How was the day #1 sneak peek? 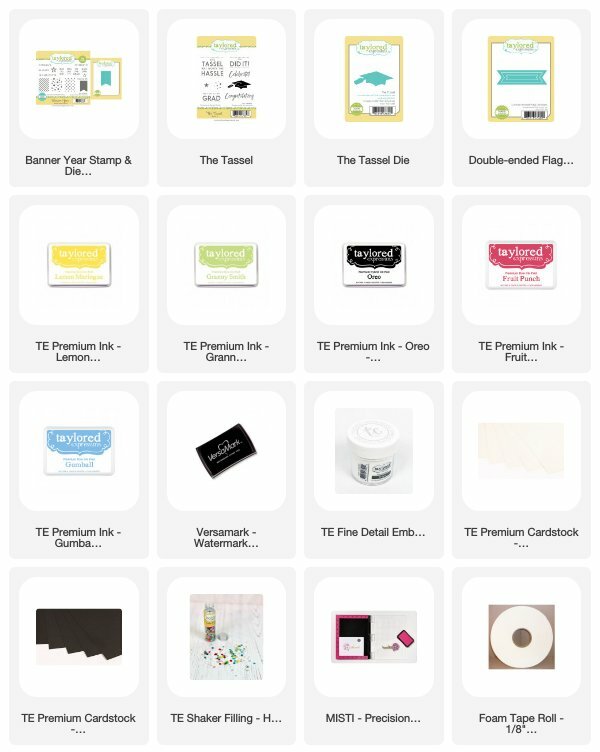 Did you like the new Simple Strips stamp and coordinating die? I love the concept of it. Taylor has a video showing how to use the Simple Strips and the coordinating die to die cut the sentiments. Here is the link to her video. Today is day #2 of sneak peek. I have two new stamp set to share with you. The first one is called Bubble Greetings-Grad! 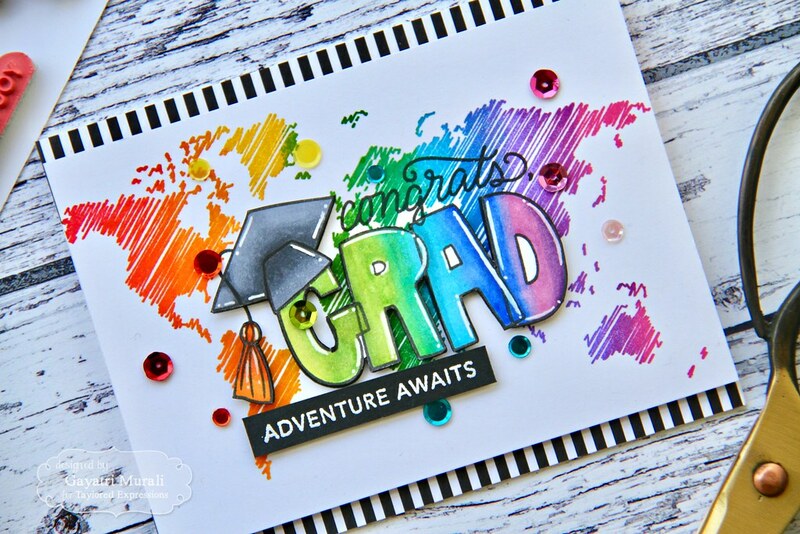 I paired this stamp with Color My World stamp set to make my very colourful rainbow card. I used MISTI to ink up the map image from Color My world stamp set and stamp on Sugar Cube cardstock panel. The inks I used are all distress inks. I used Barn Door, Spiced Marmalade, Mustard Seed, Mowed Lawn, Salty Ocean, Blueprint Sketch, Wilted Violet and Picked Raspberry. I LOVE the scribble pattern on the world map-graphic and trendy. 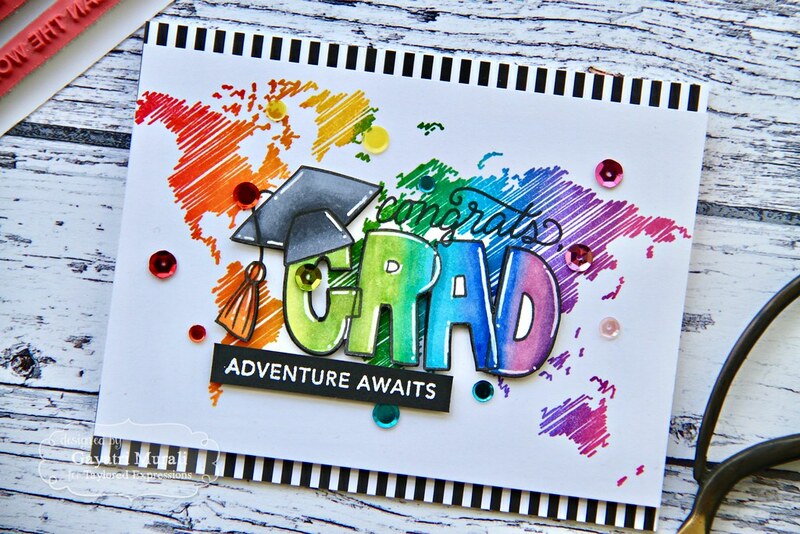 Then I stamped the Bubble Greetings Grad on Sugar Cube cardstock using Oreo hybrid ink and coloured the image using copic markers in the corresponding colours on the background. I hand cut out the greetings and added highlights using white gel pen. I stamped this sentiment on the middle of the background using Oreo hybrid ink and adhered the cut out sentiment using foam adhesive over the stamped sentiment. 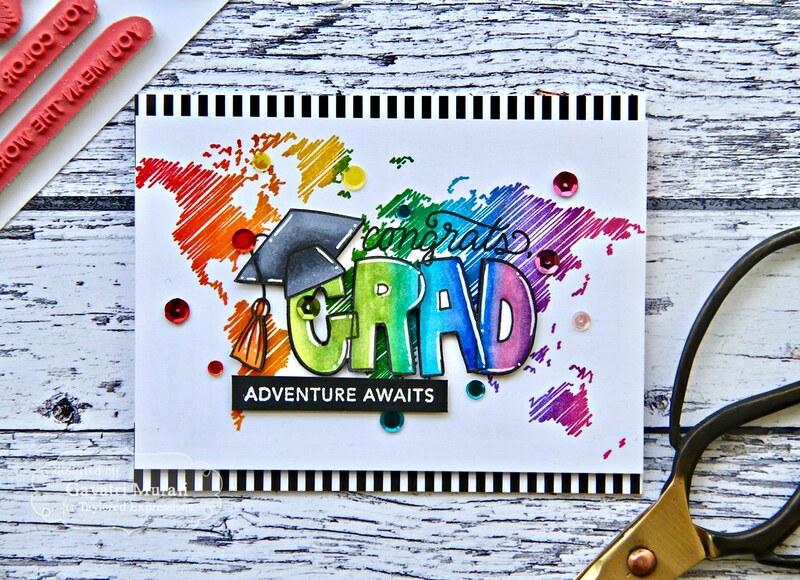 The secondary sentiment is from Color My World stamp set is white heat embossed on a strip of Oreo cardstock and adhered below the Bubble Greetings Grad sentiment. On the card base, I adhered two strips of black and white striped pattern paper from Playful Pattern Black and White 6×6 paper pack. The panel is adhered on the centre using foam adhesives with the black and white strips showing on the top and bottom of the card front. A few TE sequins in rainbow colours to finish off the card. 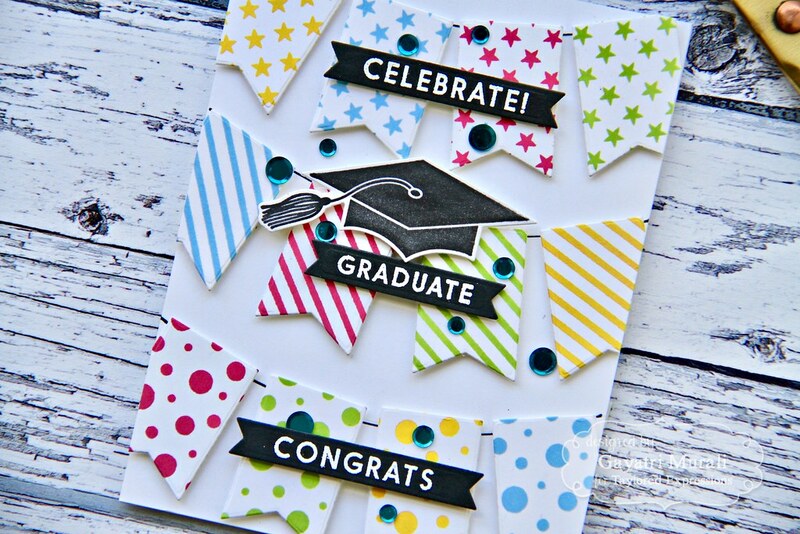 The second card is another graduation card showcasing Banner Year stamp and die combo. 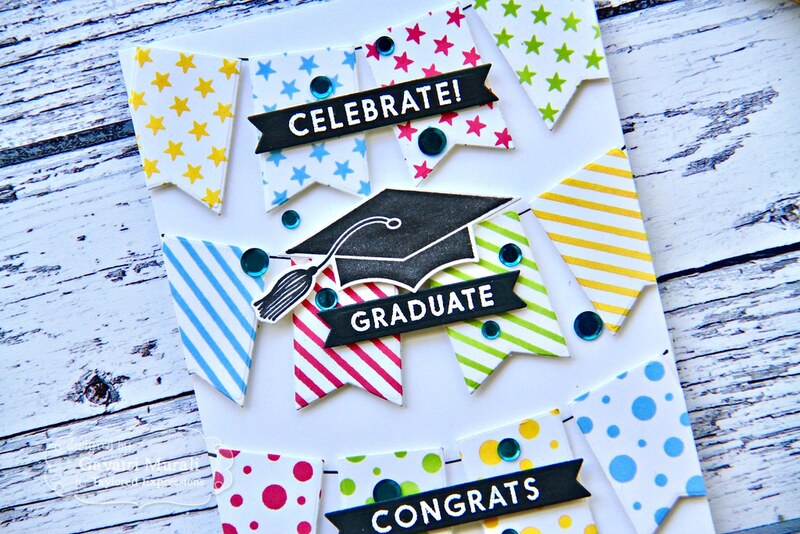 I paired it with the new The Tassel stamp set and coordinating die. I stamped the patterns on Sugar Cube cardstock using TE Fruit Punch, Granny Smith, Lemon Meringue and Gumball inks. Then using the banner die I die cut them all out. I drew a semi circle using a large plate three times on the card front using black fineliner. The adhered the banners to each of the semi circles using foam adhesives for added dimension. 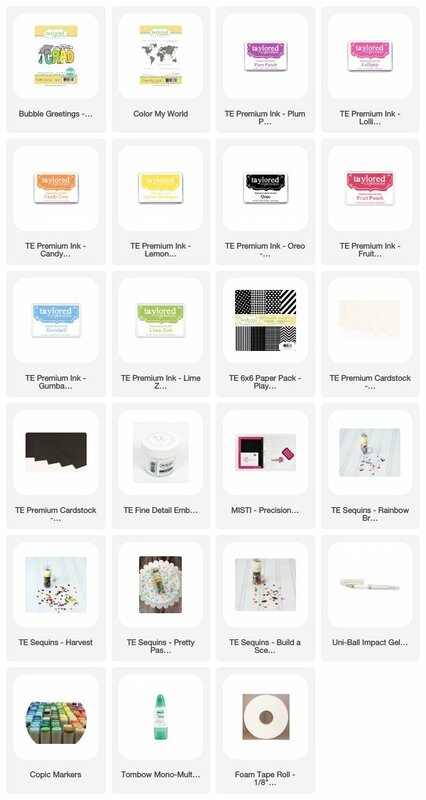 The sentiment from the Banner Year stamp set is white heat embossed on strips of Oreo cardstock. I trimmed the ends into fish tail banners. 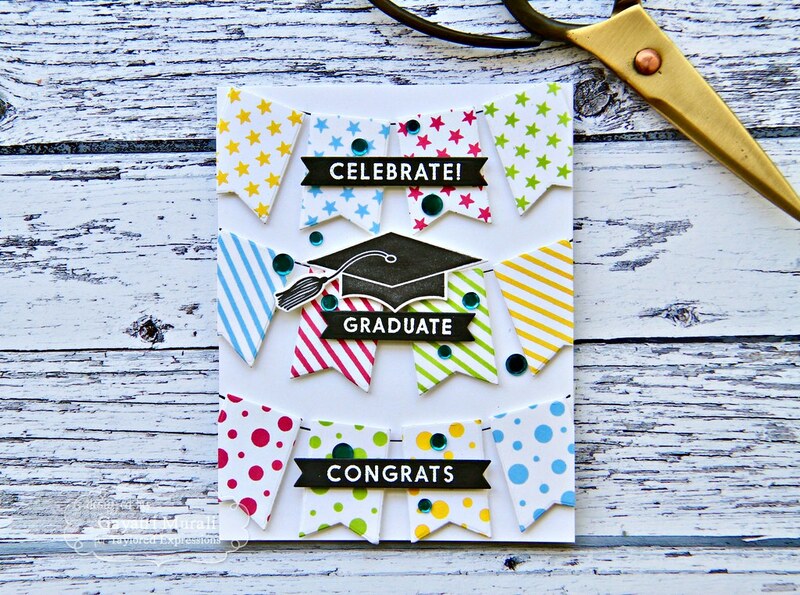 Then I also stamped the graduating hat from The Tassel stamp set in Oreo hybrid ink, die cut using the coordinating die. I adhered them all as shown in the photos using foam adhesives. A few TE sequins to finish off the card. Check out Taylored Expressions Blog for more inspirations from Taylor and rest of the design team members. Also answer the question of the day to enter a chance to win prizes. Thank you very much for taking the time to visit my blog today. See you tomorrow with day #3 sneak peek. Are you ready for some new release sneak peek? I don’t know about you but I have been waiting for such a long time to share them. 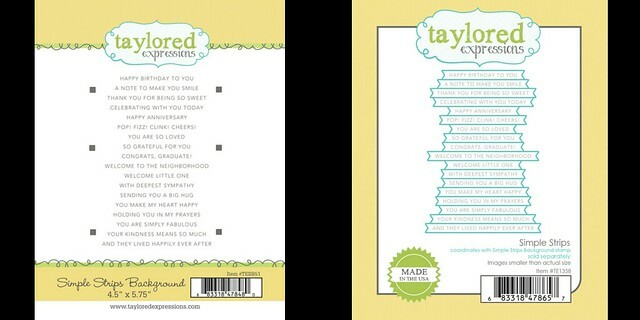 From today till Thursday I will share projects using Taylored Expressions April release products. 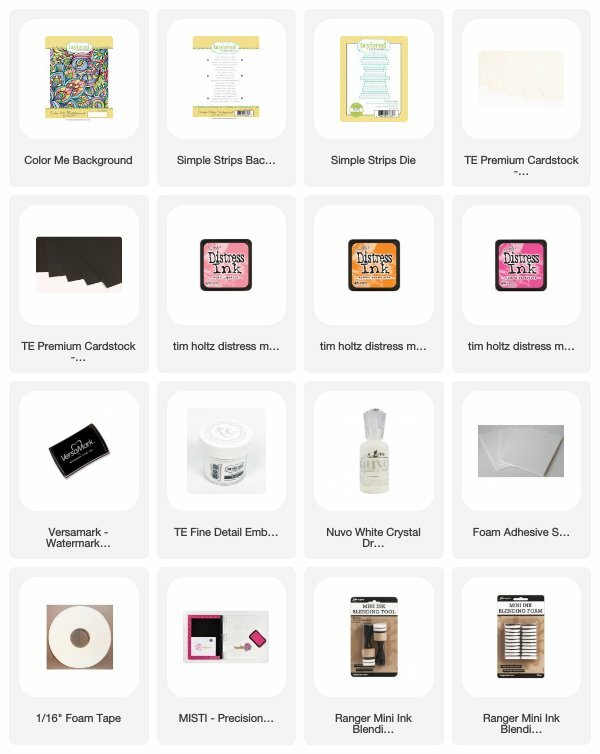 Thursday is the release day when all these goodies will be available for purchase. Hello and welcome to my blog post. On day #1 I am excited to share this new stamp set called Simple Strips Background stamp and coordinating die. 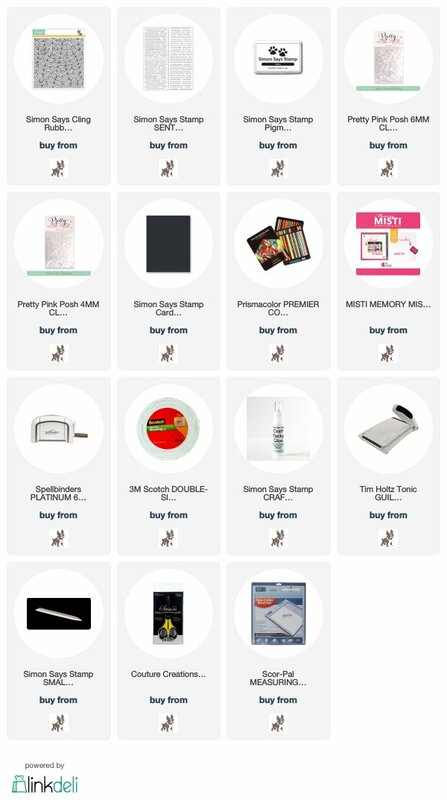 The stamp is one large piece of stamp with eighteen sentiments. You can stamp them all at one go. Then using the coordinating die which is also one large die, lines ups beautifully with the stamped sentiment to die cut them all out at the same time. 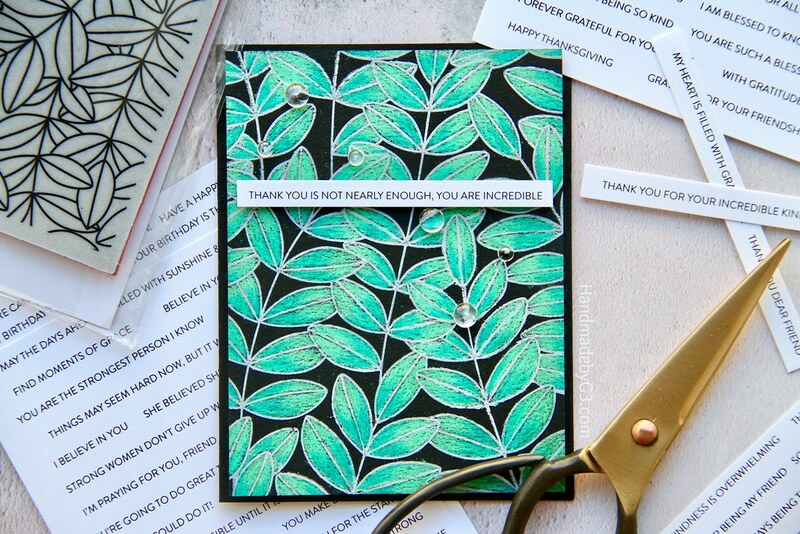 You can use one sentiment for your card and save the rest for later use. 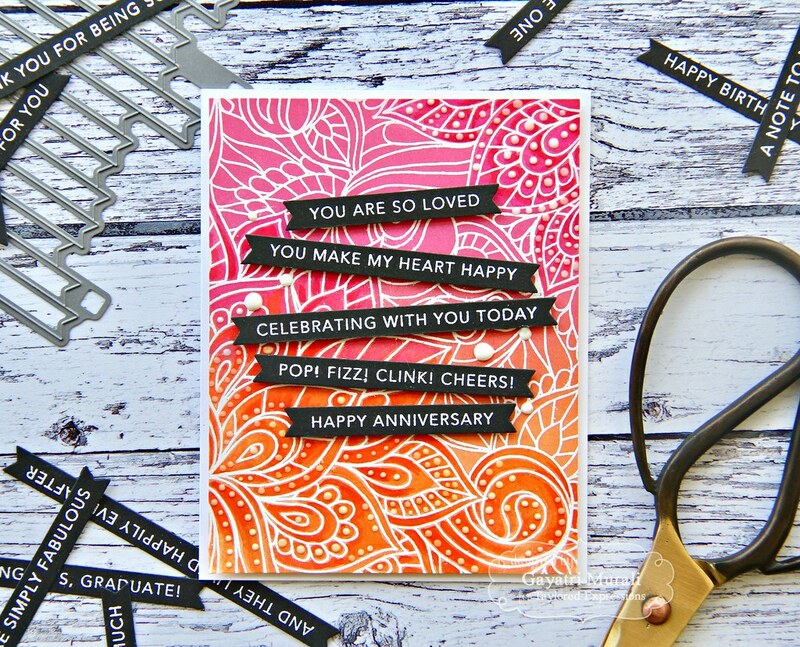 No need to dig through stamp sets, stamp, emboss and die cut a sentiment. One less step to complete a project. I am all for making life easy. I love love this concept. 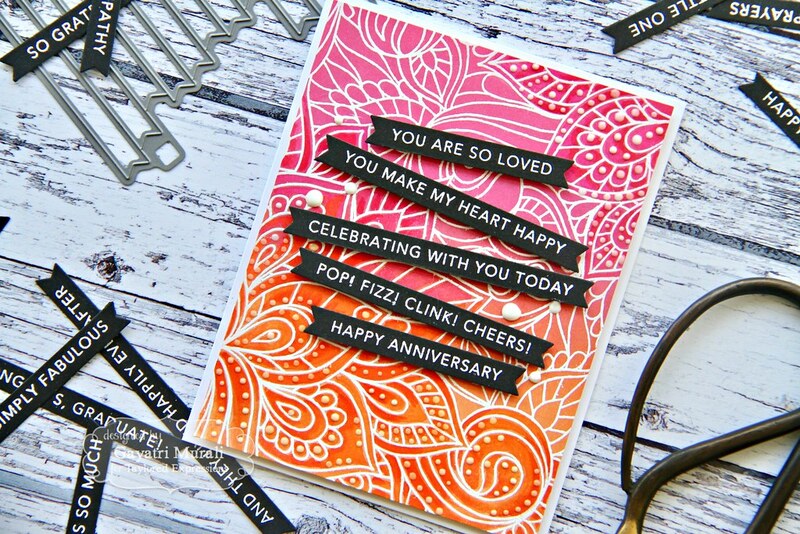 I paired this new Simple Strips background stamp with a previously released background stamp called Color Me Background to make this card. The Color Me background is white heat embossed on Sugar Cube cardstock, sponged with Spiced Marmalade, Worn Liptstick and Picked Raspberry distress inks for an embossed resist background. Then I used copic markers in the orange and pink which are slightly darker in shade to Spiced marmalade and Picked Raspberry to added shading to the image on diagonally opposite side. 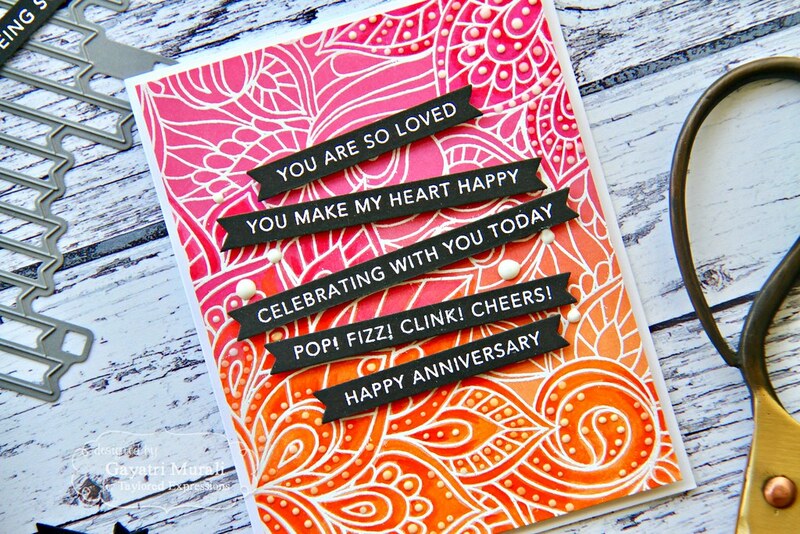 I white heat embossed the sentiment using Simple Strips background stamp on Oreo cardstock and die cut all the sentiments using the coordinating dies. I adhered the five sentiment I thought go well with each other randomly on the middle of the background panel using foam adhesives. Then using Nuvo white crystal drops I added some details on the background. The completed panel is adhered to the Sugar Cube card base using craft foam. 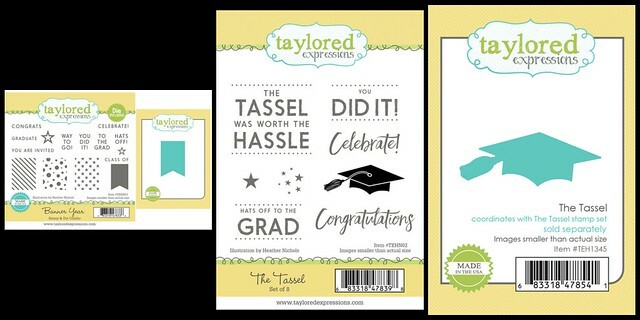 Head over to Taylored Expressions Blog to see more sneak peek inspirations from Taylor as well as rest of the design team. Taylor also has giveaway as always using question of the day. So make sure you answer the question over at TE blog to enter a chance to win. Thank You is nearly not enough! I am back after my trip to India for a wedding. I must say I throughly enjoyed this trip. This wedding was the best one I have attended in my lifetime. I met many relatives for the first time in person although I have known about them. So friendly, fun and no hangups. It was busy till the last day but the good kind. I did not touch my laptop for that one week. That is very strange of me. Has never happened in any of my holidays. That tells you how much I enjoyed this trip. I didn’t have the time to meet any crafters or friends which is sad. Next time for sure. I am still jetlagged. I think it gets worse with age. As if that is not enough to deal with, I dropped my phone on the road and broke it. First time dropping my phone let alone breaking it. I was and still is so mad about it. How could I? I was anxious about surviving without a phone. But strangely I did not miss my phone. I got a lot of work done at home, craft and slept early. Maybe I should regularly have phone and laptop free days. Something to consider for the entire family not just for me. Too much rant. Let me get to my project I made on my phone free day. 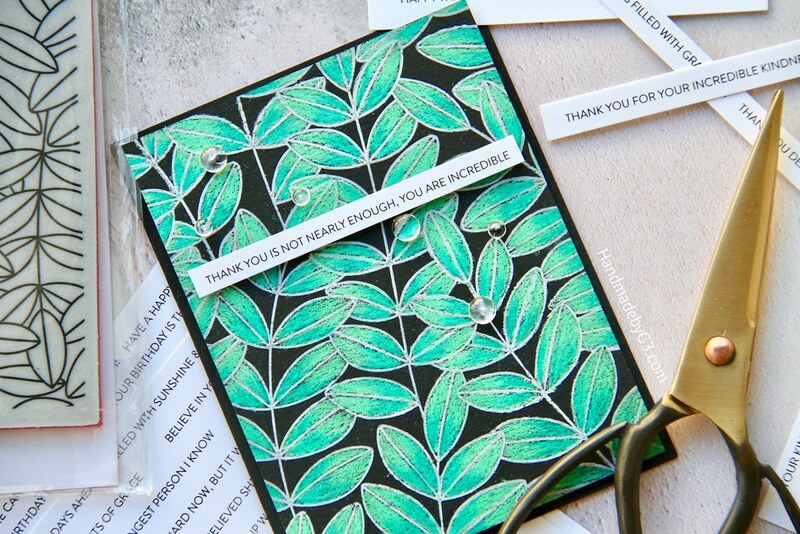 I used Simon Says Stamp’s Fresh Bloom collection products to make this card. 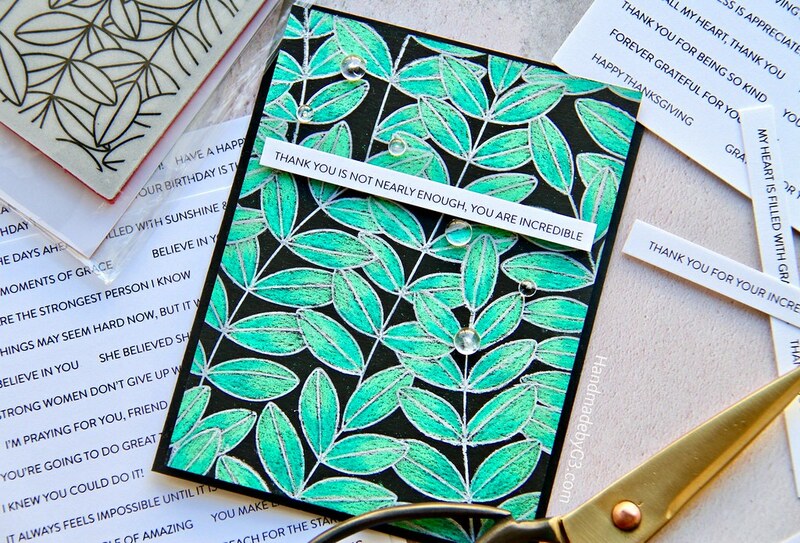 I used Simon’s Outline Leaves background stamp and the sentiment strips to make this card. I stamped the image using white pigment ink on black cardstock and coloured using Prisma colour pencils. Then trimmed a sentiment from Sentiment Strips to add a sentiment. A few clear droplets to finish off the card. the background is the highlight of the card. Here are some closeups of the card. Thank you so much for stopping by and have a wonderful weekend. !